I’ve kinda wrapped WIP Wednesday and the Stringchronicity Podcast into one great big gooey package today. Today, we’re going video! If you’re seeing the W with the bouncing star, you’re on the right track. Give the video a little time to load. I had a birthday, and we got snowed in! Oh noes! The three books I mention were bought at Shelf Life Books, Calgary’s newest Independant Bookseller. Support your independant local businesses! The books: On Tender Hooks by Isabel Samaras, Wuthering Heights by Emily Bronte and The Picture of Dorian Grey by Oscar Wilde. MIL’s Socks by Sue Grandfield: The February Socks are off the needles! 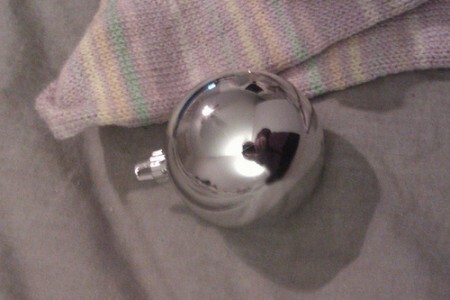 “Secret” Sock: Something I’m working on developing. No details available at this time. I can tell you that I’m working with the Lorna’s Laces Shepherd Sock Multi in Robot Overlord. 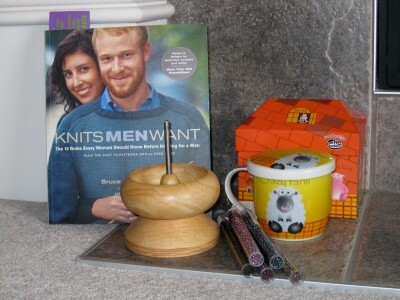 I review Knits Men Want by Bruce Weinstein. I also look at it from my own point of view as a person whose grandmother seemed to know exactly what it was you had to do to get a guy to wear a hand-knit sweater. Check out the Knitviews videocast by Kristin! MIL Socks: Cast on for the Skinflint Sock Club! Sock club? Sockalong? What would YOU prefer to call it? This month is the MIL’s Socks by Sue Grandfield. I cast mine on in Estelle Cadenza! I yammered on this week about Ravelry, and some of its more interesting features. I then did a review of the new Knitscene. I approve! There were a couple of hoodies that I would knit! My shoutout this week is to 3 Ewes Twisted in Fiber. You can find more about them on Carin’s Webcast, since that’s where I found out about them. February Lady Sweater: On the last couple of rows of the yoke before separating out the armholes and getting into the lace pattern! Noro Shawl: Got a few rows done last week, but as it’s gotten longer to get through, it’s getting a little harder to sit down & concentrate on. Has been put slightly aside for things that can be put down once a row has been started. Inverse Glynis Socks: Not going so well. Problems with having to rip back multiple times. Makes me not such a happy camper. Simple Sock: No real designer. Just a toe-up sock with a gussetted heel & a picot trim at the top. Fallen London (need a Twitter or Facebook account to play. My Twitter name is Yzorah, if you want to look for me). – I’ll choose some patterns, and you use your own sock yarn to knit ’em. At the end of the year, you have 12 socks. – Hopefully at least one pair will be suitable for people on your Xmas list, if you do such things. I’m hoping to design at least 3 or 4 socks this year as a part of my personal goals. For those months where one of those socks is the recommendation, I’ll knit something from one of my books. – That said, the socks I recommend that I DON’T design myself will be Free patterns on Ravelry. – I’ll try to give you a heads-up as to yarn choice around the 15th of the previous month. – For this month, your assignment (should you choose to do it) is to get some of your favourite self-striping sock yarn and do a simple sock. Cuff-down, toe-up…it’s up to you. Just a plain & simple vanilla sock. Go to it! For February, let’s go with a subtle or medium-variegated handpainted yarn. No stripes, and nothing too terribly solid-coloured OR wild. Something fun without being too over-the-top. – In Dreams Mystery Shawl by Susan Pandorf. Part of the LOTR KAL. Looks like it costs $9 USD to get in & signups run through Friday, 4th February when the first clue comes out. – Lady Jessica by Veronica O’Neil. Victorian-goth inspired cowl, Perfect for a night out with some red wine and a soundtrack featuring the Cure and Switchblade Symphony. – Ellinor by Maria Naslund. Very pretty lace beret! Mountain Colors Hand-Painted Yarns: Thank you Nanettethenanny and Susan93940 from Ravelry! My own Shoutout: To Plurk. I’m still trying to figure out how to use you effectively! Stringchronicity Episode 13: Happy New Year! Happy New Year! Hope yours went well! I’m still a little scattered-sounding, but at least I’m back to podcasting on a weekend instead of catch-as-catch-can during the week. I talk about how busy the Christmas season was, particularly regarding the amount of households we visited. I also mention that swag was exchanged amongst family members. Some of my standout items were a gift certificate for Pudding Yarn, a set of hand-blown glass bowls, a couple of of graphic novels (Endless Nights by Neil Gaiman, Sense & Sensibility by Jane Austen), and a pair of 2.5mm Signature DPNs. They’re hot pink & very pointy! I may also have mentioned a Dyson Vacuum cleaner. Holy moley, we were spoiled this year. We spent New Years with our friend Lhiabelle and her family, and New Years Day we just happened upon our friend Morgan and her family at the local Safeway at the Starbucks stand. Thank you Safeway & Starbucks for being open for our impromptu coffee meetup! February Lady Sweater: Now that there’s no big push for socks, I can relax a little & work on the FLS. I’m looking forward to hopefully getting it done in time for February! Noro Striped Shawl: I took the cast-on from Ysolda Teague‘s Ishbel and married it to the increase pattern from the Gaia Shawl (I think). I’m just alternating two colours of Noro Silk Garden Sock Yarn every two rows. It’s turning out VERY pretty! 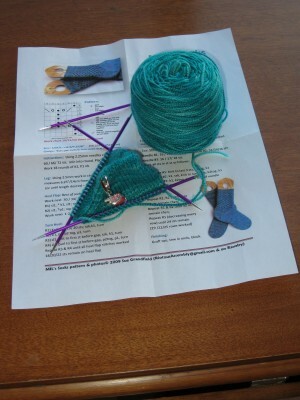 Glynis Sock (kinda): I’m taking the lace pattern from Cookie A’s Glynis Sock (Sock Innovation), and doing it toe-up. 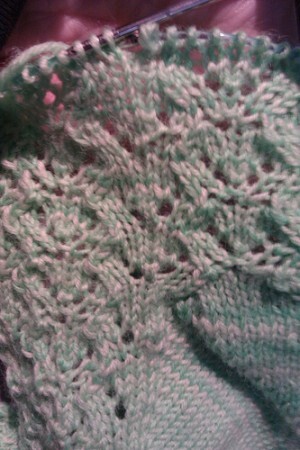 The lace pattern looks pretty much the same whether it’s toe-up or cuff-down. I’m going to Fleegle the heel. I may do the same cuff treatment, or I might picot the edge. We’ll see. I’m considering doing my very own Self-Imposed Sock Club (SISC) a la Stephanie Pearl-McPhee. The Glynis sock would be sock #1 of the set, even though I started early. 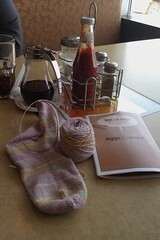 We’ll see how it goes, because I also loosely (as in, if the whim strikes me) follow the Sock Knitter’s Anonymous KAL. Also a WIP? My blog. I’m trying to post as daily as I can. At least 3x/week. If you see any “weird” topics, it’s probably because I’m getting ideas from the Daily Post project from WordPress. I reviewed Knitting Socks with Handpainted Yarn by Carol J. Sulcoski. My opinion is that while there are some pretty interesting “art” socks that I probably wouldn’t ever try, there are some other, rather gorgeous socks that I most definitely will. The book is definitely worth picking up. In fact, the Escher socks by Lorna Miser are on my tentative list of SISC socks. Music at the end of the podcast is “Resolutions” by Jonathan Coulton from his “Thing a Week” series. Stringchronicity Episode 12: Happy Solstice! 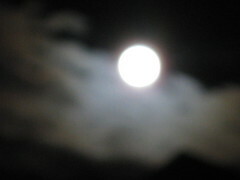 This week we celebrated the solstice with an amazing lunar eclipse! I only got to see the first part of it (the pre-show, perhaps? ), but it was well worth it. Apparently the last time this happened was in 1638, so I’m pretty happy I was around to witness even a part of it. I will attempt to add more show notes later edit them in). Right now, though, I’m pretty tired and about ready to drop. A very special thank-you to the Knitmore Girls, for not only giving us a listen, but for then tweeting about it, and subsequently mentioning it in their own podcast. Ladies, you rock. We’ll make sure you’re set up with some really nice beer and deep-fried pickles if you ever find yourself in this neck of the woods. Seriously. Hello to all the listeners from the Stringchronicity Podcast who may make their way over this-a-ways. We’ve picked up the domain stringchronicity.net and it is set to direct over here. I’m sure there will be some transition til all the bugs are knocked out, but things will be running smooth eventually! Why this Podcast is/was late. How poor eating habits can have a holistically bad effect on your health. Ow. I briefly mention the fact that I’m in Windows XP & keeping myself from firing up Sims3. Still not playing World of Warcraft. Why were we cleaning last week? Black Hole Socks of Doomy-doom. Don’t get me started. I then proceeded to do a review of Wendy D. Johnson‘s Socks from the Toe Up. Google Reader, for making it easier to organize (for reading, of course) all the blogs I follow! I actually spent the bulk of today working on my script while the computer updated to Ubuntu 10.10. So far, both the computer and the podcast seem to have gone well!